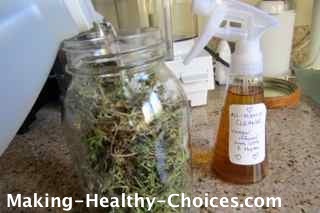 Homemade household cleaners; learn to make your own completely natural, non-toxic and disinfectant spray cleaner. Did you know that in many homes the air pollution level is often worse than it is outside! Using toxic house cleaning products is certainly something that adds to this. Your home is your sanctuary and it is prudent to treat it as such. Avoid toxic chemical cleaners and toxic body products and instead begin to use only natural alternatives. At the store they sell a different cleaner for every part of the house. They encourage you to have a cupboard full of cans, bottles and sprays and these products are generally filled with toxic chemical agents that take away from the health of you and your family. You will often see poison control warnings on these store bought products - they are obviously not safe - why would you want to use them??? Aside from all of that, those store bought cleaners are expensive!! There is no need to use chemical cleaners. 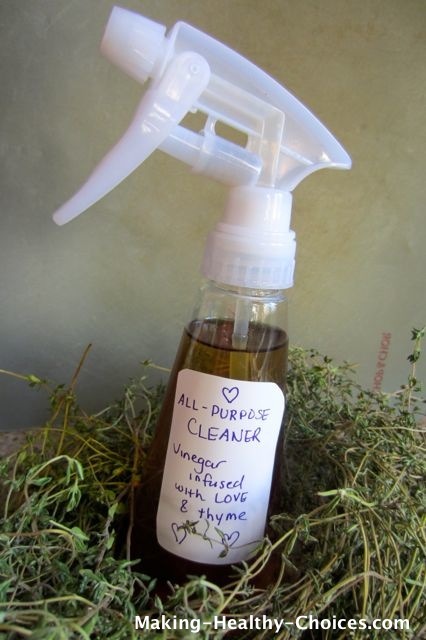 You will love how easy and inexpensive it is to make your own cleaners! That's it ... just two simple ingredients! Fill glass jar with thyme (if using fresh fill to the top, if using dry fill about half way). 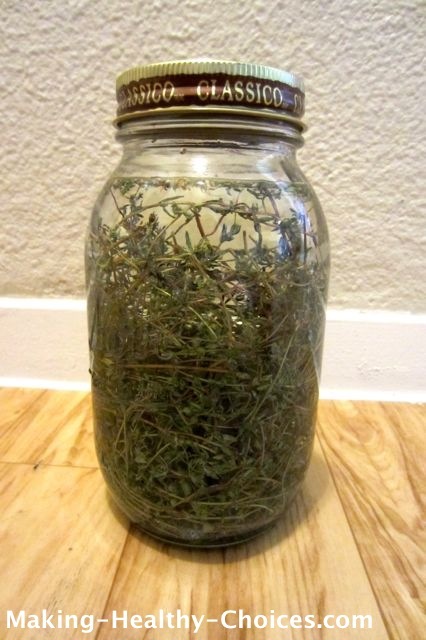 Fill glass jar with white vinegar to the top, covering all the thyme. Let this sit for anywhere from 24 hours to 2 weeks. You will notice the vinegar taking on a beautiful pink hue as it becomes infused with all the great properties of the thyme. 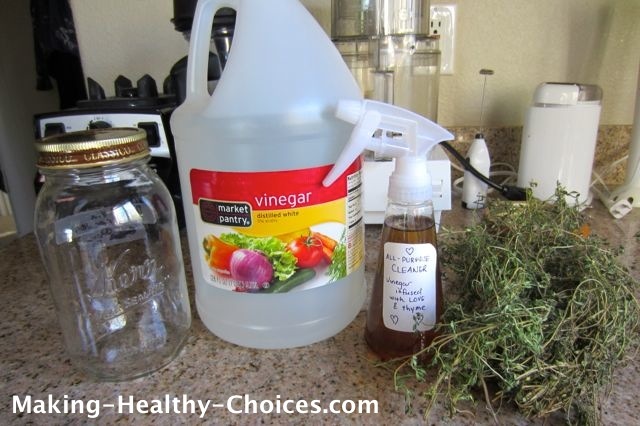 Strain, compost the thyme and bottle the infused vinegar into a spray bottle. Cleaners like this can be used on many areas in your home. Move away from the marketing campaigns that would like you to believe that you need a different cleaner for every job. Thyme (thymus vulgaris) is a plant that has been long known for its healing and cleansing properties. Thyme has a beautiful aroma that will fill your house with a gorgeous fresh scent when used for cleaning. Thyme is antiseptic, antibacterial, antimicrobial and antifungal and was even used during war times to disinfect soldiers' wounds. It is a very powerful plant! Vinegars have been made and used throughout the ages. It is one of the ancient recipes full of wisdom that has successfully been passed into the modern world. Vinegar is antibacterial, antifungal and deodorizing. Take hold of your health, start replacing your toxic house cleaners with more natural ones. 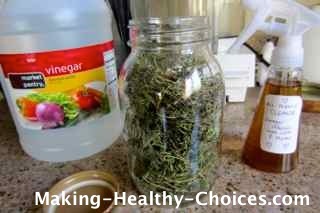 Making homemade household cleaners is easy and inexpensive. Your house will be clean and the health of you and your family will benefit greatly!! 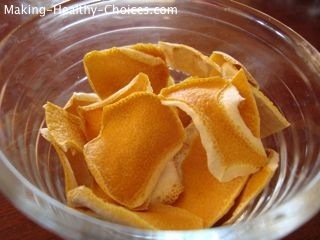 Another idea that also works great is to steep dried lemon peels in white vinegar. Let this steep for about 2 weeks. After 2 weeks, strain and bottle in a spray bottle. 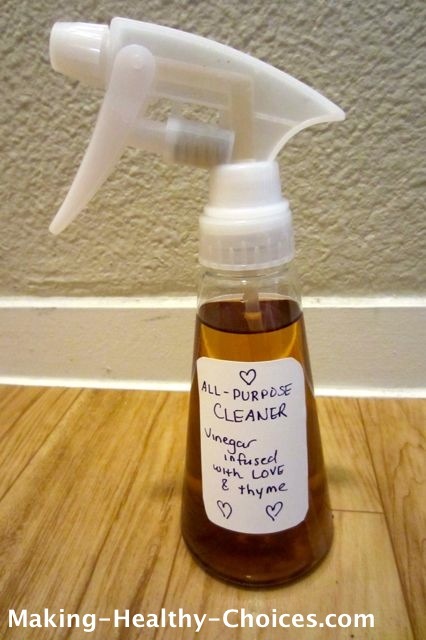 Voila, another all-purpose spray cleaner.